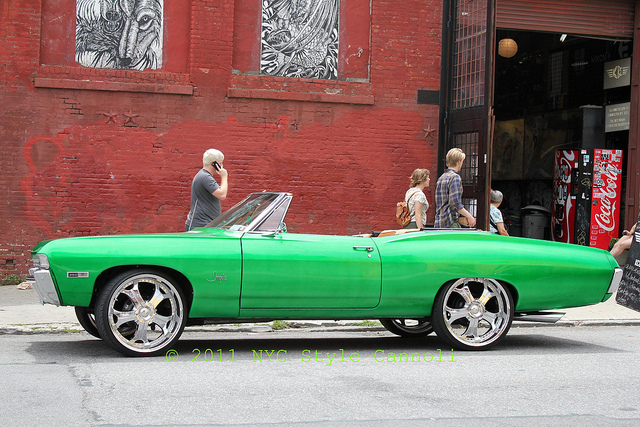 Photo Gallery Tuesday " A Vintage Chevy in Brooklyn"
I finally made it to Brooklyn this weekend...yay!! While we were shopping around, this wonderful green Chevy from I think the 1970's parked on the street. Everyone stopped to look at this great car and with the top down, got to see the wonderful interior as well. Just another treat being in a NYC borough for the day!! What a wonderful classic car and in such an arresting colour. The American Dream lives on for some lucky person. We are not at all surprised that it attracted much attention from passers-by. Merisi you are too funny!! It is for sure the Kermit color! I think the guy restored it which is also pretty neat as well...glad everyone is enjoying! !